Isn't this just the cutest image?! I started off by printing this little darling onto my favorite card stock. I've talked about this in previous posts but, just in case you're new to my blog, I just LOVE using Cryogen White Iridescent card stock with my digital images. I always get a crisp, sharp image and it does not smear when I use Copic markers on it. But the very best part about this card stock, is that is has sparkles on it already.Yep! 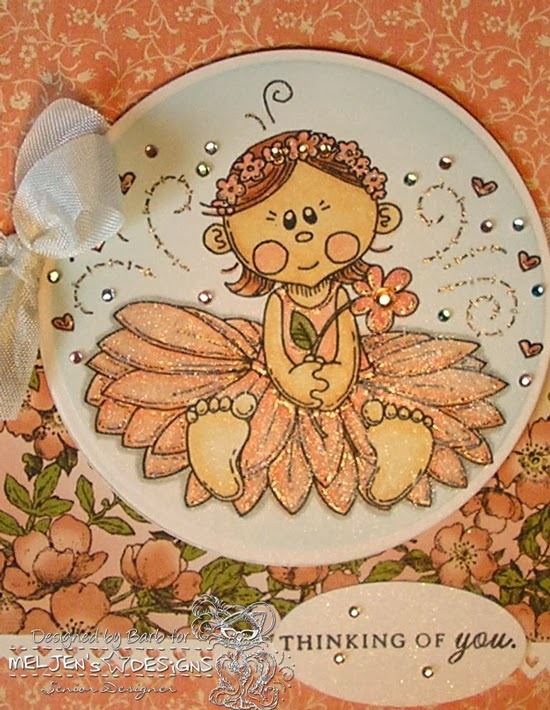 The whole thing just shimmers and sparkles in the right light and so it's perfect for this challenge. Back to the card...I die cut the image and then colored her with Copic markers. Then I put the image back in the die and brushed on a bit of blue ink to make the image pop. Next I added a thin coat of glue to the tutu and sprinkled on crystal glitter. Then I outlined all the swirls with a glitter marker and added lots of tiny twinkles. I used glossy accents on the hearts and put a dab of glitter on them too. I'm telling you, this is one SPARKLY card! Here's a little detail shot for ya! I added a seam binding ribbon bow, a sentiment with a few twinkles sprinkled on and that was it. This was a super fun challenge and I hope you will join us. You could win FREE digital stamps. Just remember, you must use a MelJen's Designs image on your project in order to be included in the random drawing. Please take a moment to stop by the Design Team blog to see what the other members have created to share with you. Ok...I am also entering this card into the Share Your Project to Win contest at ScrapbookPal.com This time we are to use any Spellbinders item on a project. And I die cut my sweetie with a Spellbinders Classic Circle die that I purchased from ScrapbookPal.com Their prices on Spellbinders is FANTASTIC! That's all for me today. Thank you for stopping by! This is definitely a challenge right up your alley, Barb. Actually, I'm thinking it wasn't even a challenge for you, since you have been awesome with the bling all along. LOL Challenging for you or not, this is one adorable card. I adore the colors you chose and she is beautiful in all her blingy glory! I hope you win the other challenge you entered her into. Excellent work! Love this beauty of a card. Your sparking details make the entire card a glowing creation. The DP is a lovely complement to the darling image. The dusting of color behind the image is perfect. Oh my Barb, this is just lovely. The colours are so lovely and of course that image is just darling. I love the DP and the little bits of bling here and there. Such a wonderful card to give or receive.